what a great gift, and what a lucky friend to receive it & also be travelling to paris!! Noone tole me self covered buttons were easy either. Maybe I'd better make some too. That cover is just beautiful , what a lucky friend and not just 'cause she's going to Paris ! PJ, I've added a link from the notebook tutorial to yours. 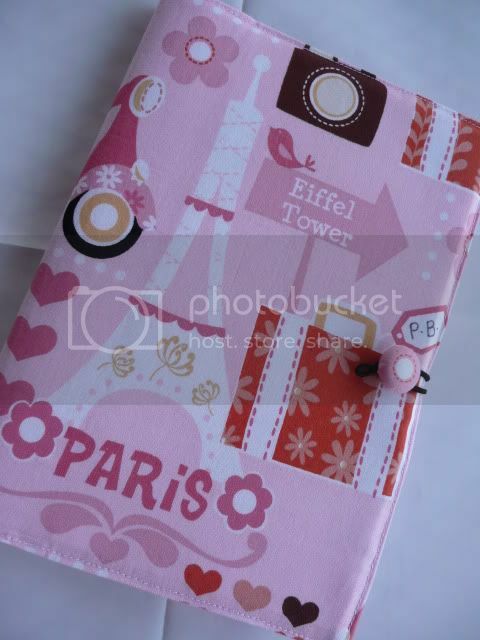 What a good idea to use a Paris fabric for a gift for a friend going to Paris! What a delightful way to gift a friend about to leave on a trip! Lovely job, lovely friend you are. What a great journal for a trip to Paris. Have you ever made a cover for a steno book and used blue jeans to put a pocket on the front? Pocket would hold pen/pencil and of course would have a row of stitching to hold the pen in place. Great for beside the phone for messages and can be changed out when full. Sew through some of the pages for tear off notes. Could you please share with us the name of your beautiful fabric?